Beckman Coulter Life Sciences expands its global services to flow cytometry customers by placing its DURA Innovations dry reagent solutions at the heart of its enhanced external business resources for laboratories. The dry, unitized reagent assays are available from LUCID custom design and cocktailing services (CDS), or in bulk through RESOURCE contract manufacturing services (CMS). DURA Innovations underpin all Beckman Coulter’s dry reagent solutions including ClearLLab.They are highlighted at the 70th American Association for Clinical Chemistry (AACC) Annual Scientific Meeting and Clinical Laboratory Expo (CLE), being held July 29 - August 2, 2018 in Chicago. Beckman Coulter Life Sciences, part of the Danaher Corporation, is exhibiting on booth #3612 alongside Beckman Coulter Diagnostics (another Danaher company). Scientists using flow cytometry techniques are resources of talent and need to free up their time to focus on investigations – not having to create antibody cocktails. The challenge for flow cytometry labs is how to reduce waste and streamline workflow to achieve greater efficiencies, while improving overall quality. Beckman Coulter research indicates that a significant amount of time spent on preparing cocktails could be avoided if a more efficient approach was adopted, especially to sample preparation. It also shows that on an average 25% of the reagents used in the lab are wasted due to factors such as errors, supply expiry, spillage and internal quality control requirements. For example, manually mixing large quantities of cocktails, say 10 specimens with single color panels, would take approximately four hours from sample receipt to first results. In contrast, our RESOURCE service would deliver the panels ready mixed to the lab’s specific requirement, completely eliminating both labor costs and reagent waste. 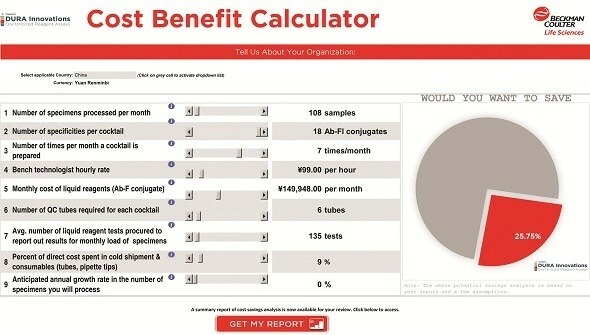 The DURA Innovations Cost Benefit Calculator Tool enables customers to see for themselves how certain practices they have taken for granted actually increase waste and reduce efficiency by hindering workflow.